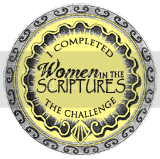 Last year at this time I issued my "Women in the Scriptures Challenge." I've decided I am going to re- issue the challenge again this year. In fact I think it will be ongoing challenge always on this blog. So if you haven't completed it yet-- don't give up-- you have another year, or another or another. If you've already completed the challenge, either the full or the half, you get a gold star to put on your blog! Lucky. I'd also LOVE to know about how the experience was for you, what you learned or what you discovered. PLEASE use the linky at the bottom of the page to link to a post you've written about your experience and insights. You might just inspire someone else to take the challenge. I am going to put a link to this post on my side bar and whenever you finish the challenge you can come back and grab this button and link up to your experience. I'd love to have a collection of lots of different women's testimonies and experiences with the women in the scriptures. Also, by request of someone who has a dark background on their blog, I've made a light colored button for the Women in the Scriptures Challenge. You can use this one or the old one which ever works best of you. I know that many of you have committed to doing the challenge this year and I am really anxious to hear your experiences! You can even do the challenge two or three times if you want. Trust me, it never gets old. I love this challenge. I just began it shortly after my husband left us again for x-number of months and I am so surprised how much women are popped up in the scriptures. I love it so far and I feel so much more closer to the Lord. And who knew you can relate so much to women thousands of years ago! Go you for putting out this challenge. I'm totally doing it, holla! oh. and p.s. I'm doing the half challenge & choosing the BOM as my book of scripture. Who knows, maybe this half challenge will turn into a full one before I know it. So excited! I started reading this fully planning on focusing on the women in the scriptures (which I did do) but when I really committed myself to reading daily (again) It was like the scriptures came to life for the first time in my life (I am just turning 30) thank you thank you for the challenge. It has helped me in my path to the Temple for the first time. What a journey it has been. I am just 9 days away!! Thank you for your inspiring and ever so eloquent thoughts and words. This truly is my favorite blog. I am always recommending it to friends!!! I started this challenge earlier this year, and became distracted, so I am regrouping. I have learned a lot from your blog, and how you go about researching the women you have chosen. I have been drawn to the women of the New Testament, and also to those women,named and un-named in Doctrine and Covenants. I am particurally interested in Emma Smith and the women of the first Relief Society. I am not sure how to use the "linky tool",so I will go ahead and put the challenge button on my blog the old fashioned way. If you can give me an idea of how to use the linky tool, let me know. Thanks for re-motivating me.